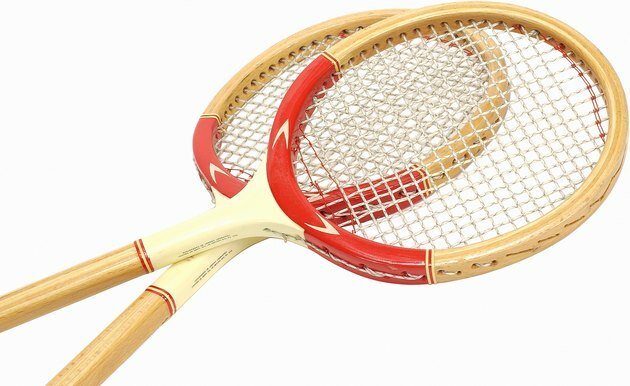 Vintage tennis rackets with long-handled wood frames and small heads strike a more graceful profile than the large, graphite rackets used by 21st-century pros. Serious collectors may pay hundreds of dollars for a rare vintage racket. More casual collectors, who appreciate classic wood rackets solely for their visual appeal, can find old rackets at thrift stores and flea markets. These inexpensive vintage rackets honor their sport's history as elements of home decor. Painted trim accents a pair of 20th-century tennis rackets. In a living room, a display of rackets creates geometric wall art with a vintage feel. Arrange them over the sofa in a sunburst pattern and tack them in place with small nails. To display a large collection, create a border along the bottom of the wall by hanging a row of rackets vertically. Make a border at the top of the wall by hanging rackets end to end. For a more formal display, have single rackets custom-framed in shadowboxes and mount them on the wall. A tennis player likely dreams about her sport. Bedroom decor that features vintage tennis rackets provides inspiration and motivation. A neat row of rackets mounted above the bed serves as a texturally interesting headboard. Rackets with no collector or sentimental value can be repurposed as functional accessories. Hang a vintage racket on the wall and display earrings on the strings. To make a wall mirror or memo board, cut a mirror or corkboard to fit the racket head and glue it over the strings. A home bar with a sports theme offers more casual display options for your vintage tennis racket collection. Hang wooden rackets on the wall or on the front of the bar along with other sports memorabilia and equipment. If the room is tall, hang tennis rackets from the ceiling with screw hooks and fishing line. To create an informal display, tuck a vintage basket or crate in a corner and fill it with old rackets, racket presses and tennis balls. If you're a true tennis fan, the U.S. Open and Wimbledon are occasions for celebration. Your vintage racket collection inspires distinctive outdoor party decor. Create floral arrangements from tennis rackets to display on deck posts. Place silk flowers and greens on the racket handle and wrap securely with wide ribbon. Finish the arrangement with a small flag from the tournament's host country. To create simple accent lighting, wind battery-powered twinkle lights around rackets and hang them in the party space.